Marsha Way entered the St. Agnes School doors in 1979 and has been an integral part of life at St. Agnes School and then St. Stephen’s and St. Agnes School ever since. 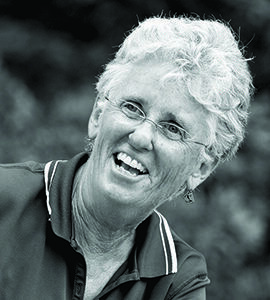 She has served as the girls athletic director for 27 years, varsity field hockey coach for 35 years, and P.E. Department chair for 27 years. Marsha has also coached several other Middle and Upper School sports teams. She grew up on a dairy farm and received an academic scholarship to college where she first played on a sports team, the field hockey team. After college she worked in Bermuda and created the health curriculum for the entire island. When she started at St. Agnes as the athletic director, teams were playing five or six games per season, she grew our programs to over twenty games per season. Coach Way lives the philosophy of working hard and having fun, and if both of these go together then it brings success. This success is evident in her field hockey career record of 514 wins, 86 losses, and 46 ties. Her teams have 22 ISL Championships and four State Championships. Marsha was twice named Coach of the Year by The Washington Post, and in 2008 was honored with the Wooten Award by The Washington Post. She has also served the Independent School League (ISL) in many capacities, including as commissioner for two years and treasurer for nine years. In the 2013-2014 school year, she was named the Alexandria Sportsman’s Club Coach of the Year and was listed as a Top 5 Coach by the National Federation of State High School Associations. The ISL leadership 'Way to Go' Award was named in her honor in 2015 and the St. Stephen’s and St. Agnes School 'Marsha A. Way Sportsmanship Award for Girls' was named in her honor in 2018. All of this is an impressive legacy, but what has made her beloved by players and peers alike is her determination and her desire to help her players reach their potential. She cheered them on and inspired them. She let them know that she cared about them as individuals. While Coach Way was the girls athletic director, she had a poster of Joan Benoit Samuelson up in her office. At the bottom of the poster it read, “There is no finish line.” Coach Way has lived with no finish line. Her can-do attitude has inspired almost four decades of students to greatness on the field and in their own lives.